Another of Sean’s photos from a few years ago … another little piece of his world. I don’t have as much time as I would like to write about Sean these days … I have another couple of songs on the way, and will type up more diary extracts, and post more of the music he liked, and more photos. It’s still strange not to have him around. He has left a big hole in the world. He certainly has. Still reading and still thinking about you. Hi Ana … nice to see you. Thanks for this. It is good what you’re doing Brendan. I know Sean better each post. That photograph shows how we are all sharing in your loss. As with Ana, I think of your little family every day. Hello Badger … good to see you too, and I appreciate the kind words. Brendano, greetings this bright new morning the 1st of June. Summer is at the doorstep of the bright red door. Music will be with you through all seasons! Greetings, PG, and thank you! I hope your family are well. Pauline was at work a couple of weeks ago … her office is on the first floor. There was a phone call for her boss, who was in the yard, so she shouted out the window: by mistake, she shouted ‘Sean!’. Yes, an instinctive thing. He certainly feels close at times. I read this days ago, but I could not reply because I felt so sad. It made me cry. A bereft mother calling for her child. I thought it was terribly sad too, Cymbeline. Hello Brendano. I like this photograph very much. I like the fresh new weeds and the dead leaves. I like the lichen on the rusting corrugated iron and I like the battered colours. Most of all, I like the hole for the messages and letters. Hello Cymbeline. Thank you. Yes, there’s a lot of life and living in the photo. You’ll remember the one of the hand in the dark with the small window … that was taken behind this door. I, too, like this photo very much … the sharp detail, the faded paintwork, the fresh green . 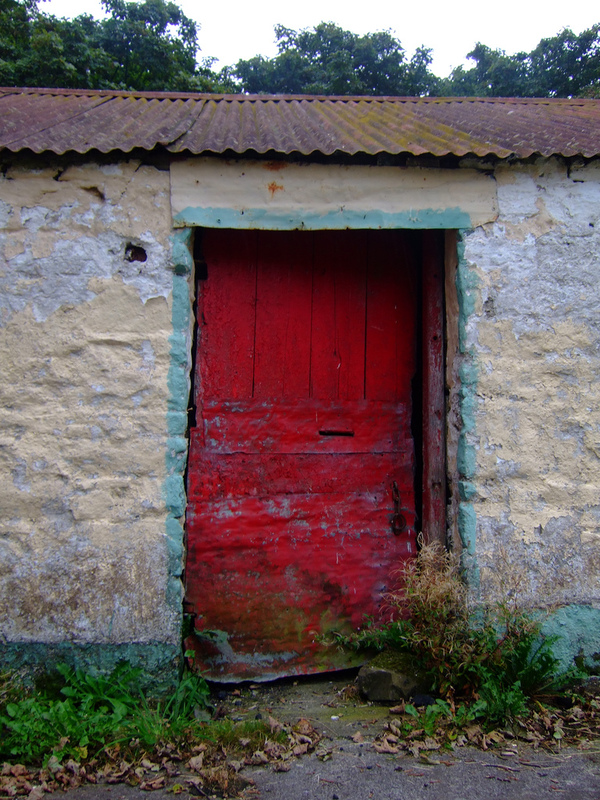 It could be melancholic with its air of abandonment but there is something about that red door that speaks of hope. Hi Marya … thanks for this. Yes, someone at some point (i.e. Ned, our deceased neighbour) has made an effort to make it look nice, although it’s just an old outhouse. I like the vibrancy of the (albeit faded) red. The huge sycamore trees behind were planted at an earlier time by Ned, and some of their seeds propagated themselves in our garden, so that we now have some sycamores ourselves. Lovely thoughts of continuity wih the springing up of those sycamore seedlings, Brendan. Yes, I like the continuity too, Marya … and to have so many trees around.